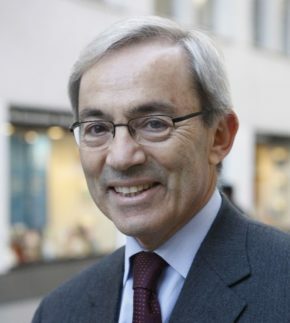 Sir Christopher Pissarides is the Regius Professor of Economics at the London School of Economics, a Professor of European Studies at the University of Cyprus and Chairman of the Council of National Economy of the Republic of Cyprus, and the Helmut & Anna Pao Sohmen Professor-at-Large of the Hong Kong University of Science and Technology. He was educated at the University of Essex and the London School of Economics (LSE), and he spent the bulk of his career at the LSE. He had long visits in the US Universities of Harvard, Princeton and California at Berkeley. Sir Christopher specializes in the economics of labour markets, macroeconomic policy, economic growth and structural change. He was awarded the 2010 Nobel Prize in Economics, jointly with Dale Mortensen of Northwestern University and Peter Diamond of MIT, for his work in the economics of markets with frictions. Prior to that, in 2005, he became the first European economist to win the IZA Prize in Labor Economics, sharing it again with his collaborator Dale Mortensen. He has written extensively in professional journals, magazines and the press and his book Equilibrium Unemployment Theory is an influential reference in the economics of unemployment that has been translated in many languages. He is frequently quoted in the press on issues concerning the Eurozone and the future of European integration. He is an elected Fellow of the British Academy, the Academy of Athens, the Academia Europaea and several other learned societies, and he is a Lifetime Honorary Member of the American Economic Association. In 2011 he served as the President of the European Economic Association. In 2011 he received the Grand Cross of the Republic of Cyprus, the highest honour of the Republic. He was knighted in 2013.